"An indispensable guide for introverts and extroverts alike." --Inc.
Every interaction is a performance, and much of our success--professional and personal--hinges on being able to inspire an audience. And while some people seem to be naturals in the spotlight, this ability very rarely derives from talent alone. Confident communication is a skill, and anyone can learn how to do it. 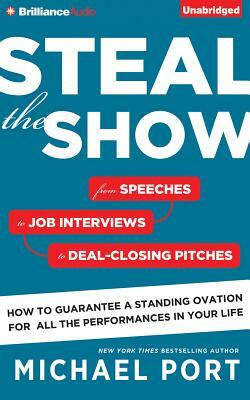 In Steal the Show, New York Times bestselling author, top-rated corporate speaker, and former professional actor Michael Port teaches you how to make the most of your own moments in the spotlight. He makes it easy to give your presentations a clear focus, engage your listeners, manage your nerves, play the right role in every situation to give your message maximum impact, and much more. Drawing on his MFA training at the prestigious Graduate Acting Program at New York University, Port has engineered a system that the non-actor can use to ensure his or her voice is heard when it matters most.